Dead Men illustrates that evolution hasn’t made a lot of difference as far as men are concerned. The end of the chase has changed little over the eons, as he drags his woman back to his cave in the belief he needs to spread his genes. When she rebuffs his advances, he resorts immediately to violence and roars in disbelief at the rejection. Our society may have changed, but as far as the Alpha Male is concerned, little has changed in his belief that he is the dominant hunter and protector. Although believing we live in a civilised society, when men are rejected by their women, primeval urges are difficult to repress. A hurt male, is a hurt male, so beware. 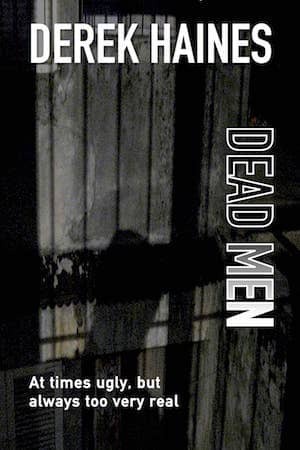 Dead Men is a raw, undignified and sad tale of men who have trouble in accepting their own failings and fragilities, and an instinctive need to blame the women in their lives for their sudden demise. Having difficulty in accepting that their women and children are not their possessions, they regress to needing vengeance, retribution and humiliation on their path to renewal. Dead Men is disturbing, uncouth and at times vulgar. A story that may surprise, offend or shock, but will certainly not be forgotten. Whether you are man or woman, single, married or divorced, you will connect with the characters and their human reactions to the trauma of lost love and rejection. At times ugly, but always too very real. This one is one of my favorites from my favorite writer. In this book Derek Haines goes more Dostojewski, than Douglas Adams, more boulevard of broken dreams, than the creation Of Sun and Moon by Michelangelo. I like the shade of hope, for at least one of the protagonists, that Derek gives us in the end..
Its not a easy read, specially not one for kids, or youths. Its raw, brutally honest and genuine. But if you like to be taken on a roller coaster ride to hell and back, this is certainly a book for you! Certain lines stay with after you’ve finished reading a book. Every book has its own memory. That I completed the book in less than 24 hours should give you a hint how gripping it was. Never a pretty read but a stunning work of reality. Beneath all the `ugliness’ (as the author points out) one appreciates the sensitivity of the characters. Not quite perfect, but undoubtedly human. With flaws, regrets, qualities and scars as anyone else. Life, of course, goes on and Hope, at the end of the day, is the fuel we all need to survive. The author makes it clear at the beginning with: “A story that may surprise, offend or shock, but will certainly not be forgotten.” He is, as always, correct.